GVSU’s new library was designed to evoke new behaviors, perceptions and experiences among students using the space. 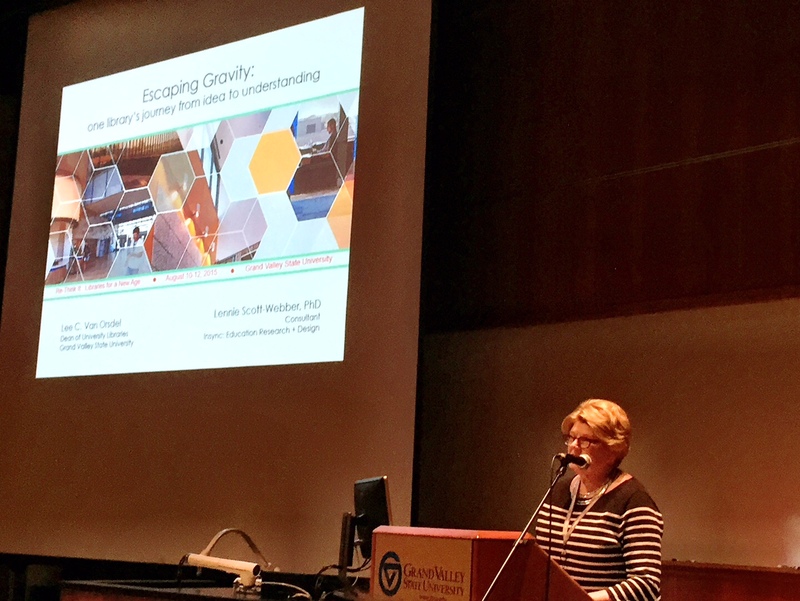 The presenters will describe the ideas that drove the design of the Mary Idema Pew Library and share the preliminary findings of a year-long research project that measured how students are actually perceiving and using the space. “Shopping Mall” – everything in one place, consumer chooses, contagious energy, serendipity. Great european train stations – many destinations, affinity with fellow travelers, contagious energy, serendipty. There is a buzz… if we get there there to stay we can then teach them something. Inspire energize + engage them. Questions: skills required in assignments, what empowers them, what makes them efficient? Students helping students, few signs, implied permissions. Different postures, food and comfort, power, places to put student stuff. 31 types of furniture in the library. Contemplative spaces, comfortable seating for long sessions, noise system to reduce sound. 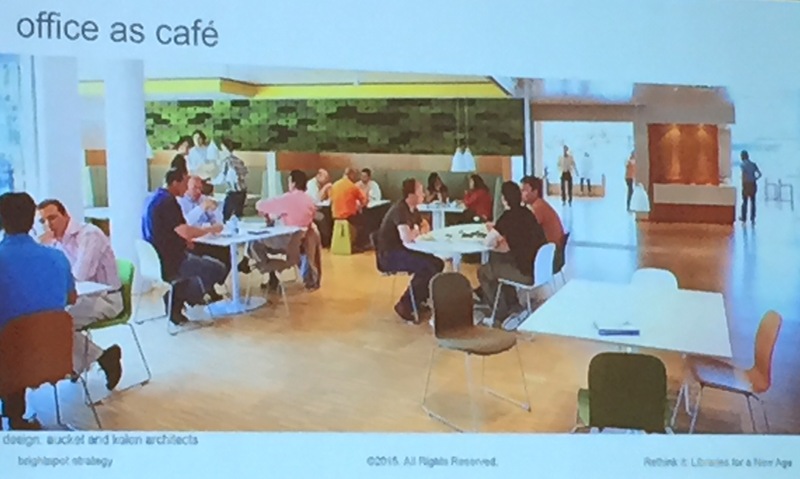 Collaborative spaces, portable tables, whiteboards, noise system to encourage sound, bright colors and lots of light. The building perfectly showcases learning through visibility. Cafe support social and longer study periods. Knowledge Market includes help desk, speech lab, writing center, research peer consultants, tutoring. 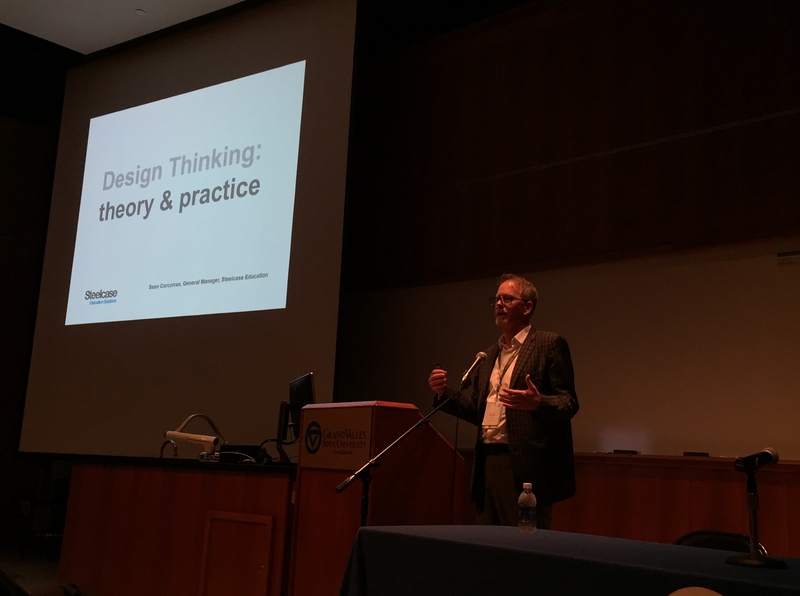 What is Design Thinking? This panel explores the messy, fun process of Design Thinking – including the end user in the design process to produce innovative solutions. Panelists will give some background about how they got involved in Design Thinking and discuss its benefits and drawbacks. 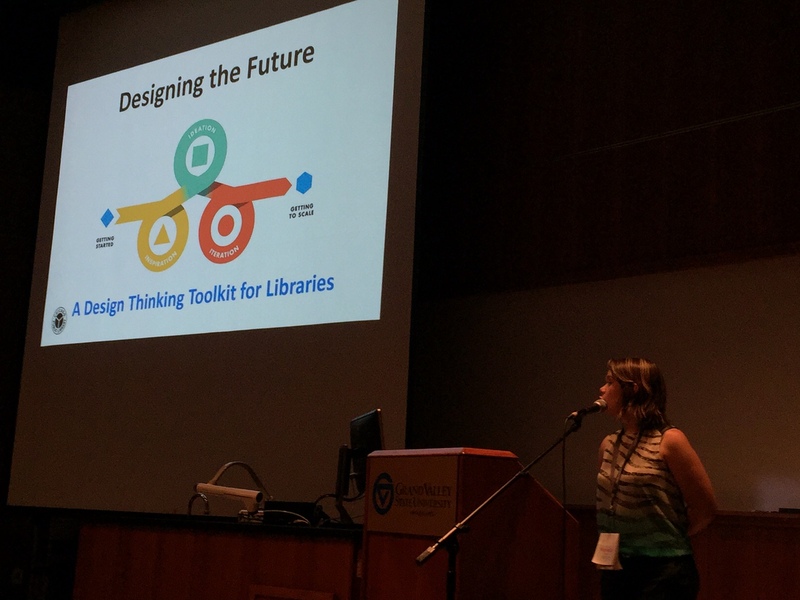 They will describe projects where they have applied Design Thinking at the Chicago Public Library and at Steelcase, including in a Design Thinking Toolkit for Libraries developed with IDEO. Panelists will address such questions as: How do you introduce Design Thinking to your organizations and its leaders? 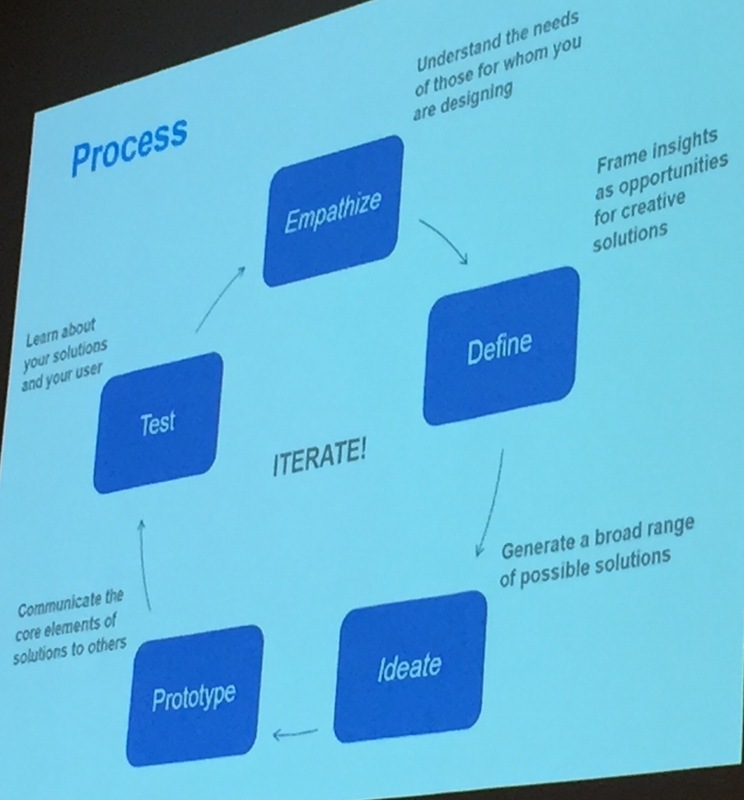 How do you use Design Thinking on a daily basis? How do you pick the right people for your Design Thinking team? Mindset of DT = Empathetic, non-judgmental, comfortable with ambiguity, collaborative, iterative, failure is OK. Conversations rather than interviews… keep it informal. 5 whys… ask them why and why and why and why and why! Observe what people do along with what they say. 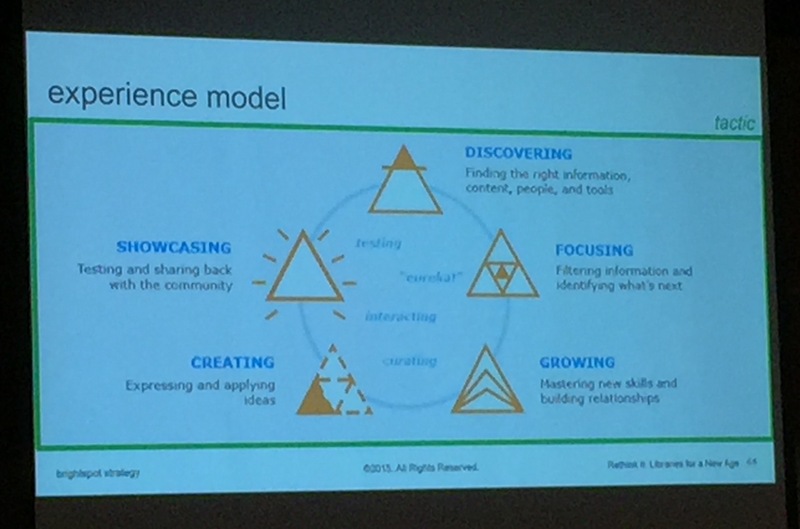 Build to learn and before that… build to think! Ideation – storytelling, organizing insights. intuitive, not obvious, generative, sticky. Iteration – prototyping to mini-pilots. Mindset and a process: say, think, feel, do are pieces of practice in empathy. Mindmixer is crowdsourcing for ideas. Elliot Felix will lead an engaging session that makes the case for change in library services, spaces, and staffing. Drawing on stories of transformation from beyond the library world, he will provide insights on shifts in purpose, offerings, and user and staff experiences. 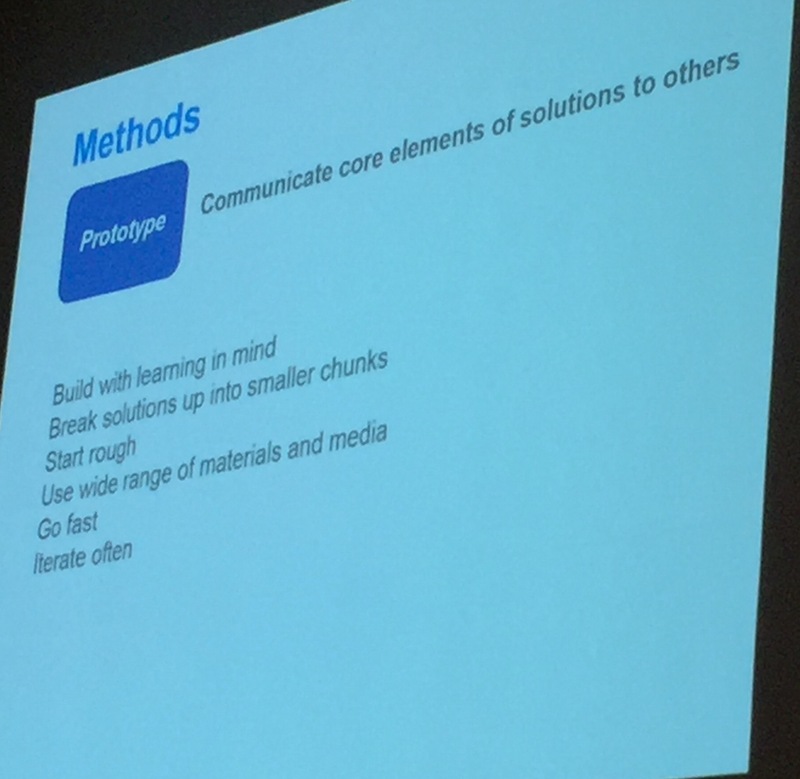 He’ll then use library case studies to explain tactics for achieving these big ideas, covering topics such as user research, visioning, partnerships, prototyping, and assessment. Finally, he’ll provide tools and tips to start working in new ways to transform your library. 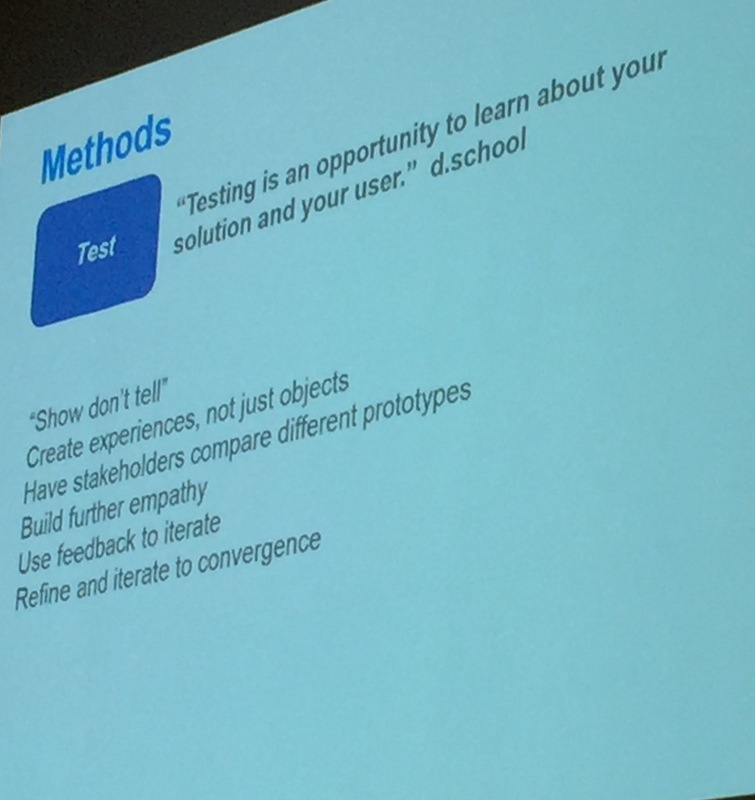 Elliot noticed that design and use are disconnected > went back to school to connect them with research. How do you shift your role to a services vs product? How can we work differently and how can space inform that? How do you move from formal board room pitch to an informal coffee conversation? How about the office as a cafe’. How do you shift your offerings from a pharmacy to a healthcare provider such as CVS. The NCSU Hunt Library offers a user experience focus. 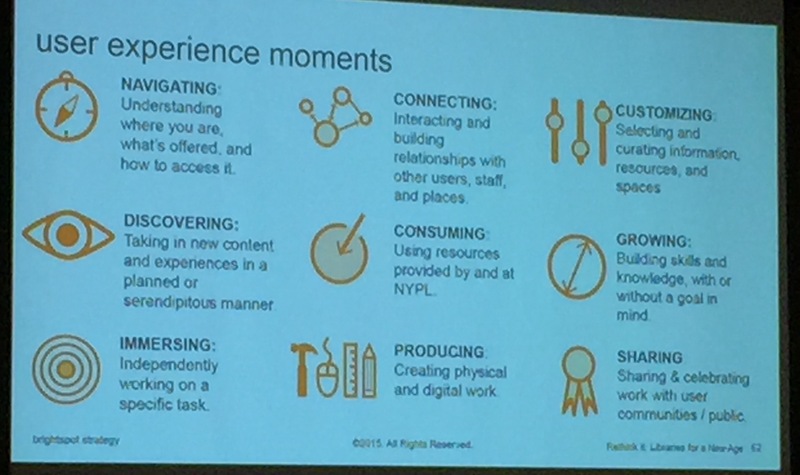 Delta is an example of an experience-based mindset for working with customers. Smithsonian mobile applications are close in how they connect the digital and physical spaces. End user research tools: data mining, surveys, workshops, interviews, shadowing, sense-making, journaling, playbook, taskforces, piloting. 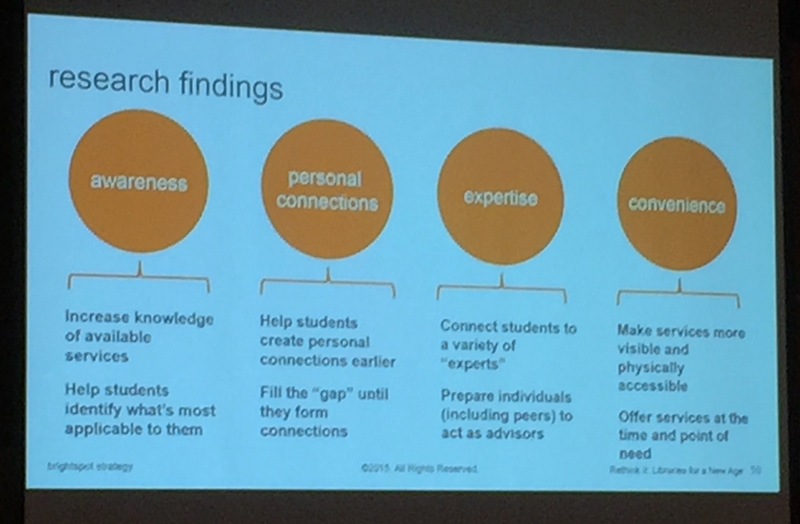 Research findings: 1) lack of service awareness, 2) opportunity to make connections, 3) facilitating quiet focus, 4) enabling skills mastery, 5) connecting physical and digital, and 6) engaging in research process earlier and later. What’s next for the “library store”? New ways for interacting with faculty, staff, and students. Making services visible. 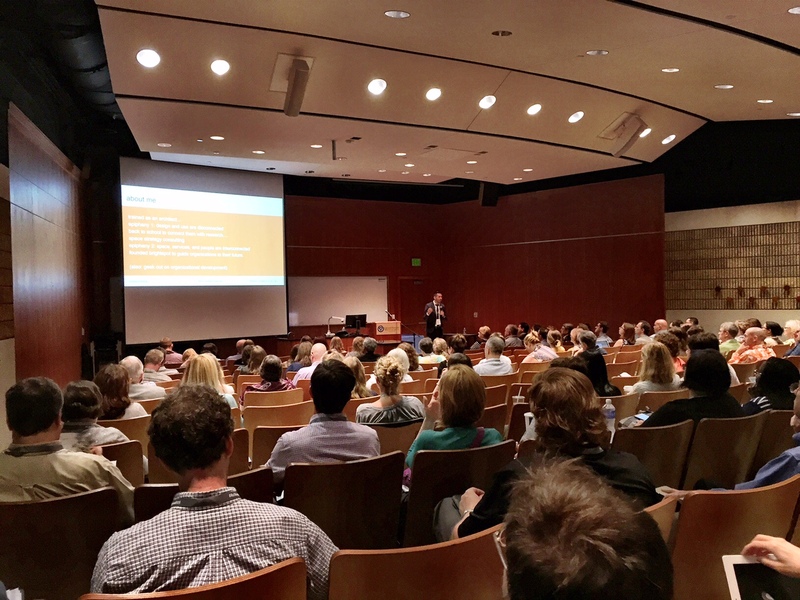 How do you partner across campus to collaboratively provide support services? 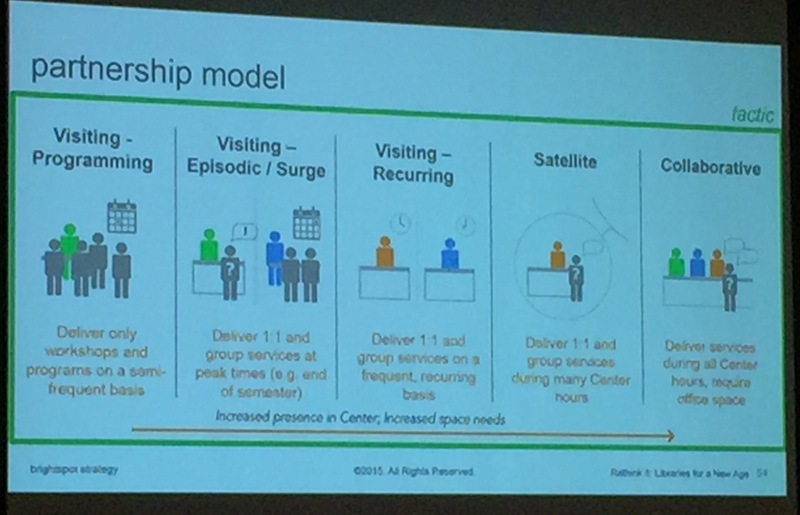 University of Virginia is an example of rethinking academic advising. Service vision includes: physical and digital, helping and directing, integration, advisors as guides, flexibility and choice, engage and empower. Role of digital.. to: save time, better matchmaking, self-service, discover opportunities, extend the experience, continuous improvement. How can you engage staff to look beyond the library and provide new services in new ways? 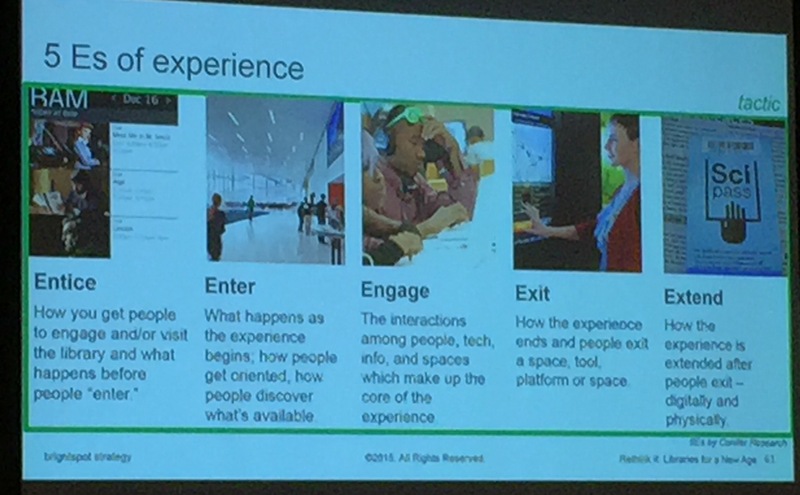 Engage with users through service safaris to mine results and see themes… what are people exited about? How can you understand and reward your most loyal users of your space? Membership programs are an example. How can you find change to showcase people and projects, say student or faculty projects? An example is to help fund some small projects through grants. eg. UofM Barger Leadership Institute. How can you proactively orient users instead of wait for questions. For example: Quick tours for new visitors. The user experience when new apps are installed.